I love going to the markets and seeing the spring and summer produce slowly appear. Every year, when summer turns to winter, I miss the abundance of fruit and vegetables that are in their prime but after a few months, it’s easy to forget what a good tomato looks like. Now that peppers, zucchini, and tomatoes are back and super cheap, I feel like my dinners would be lost without them. While there is nothing better or fresher-tasting than crunching into a whole red pepper or a lightly salted tomato sometimes it’s nice to have a warm, hearty meal. In fact, there’s nothing more satisfying than applying a little bit of heat, some herbs and spices, and coaxing the best, freshest produce into an easy, weeknight dinner in under half an hour. 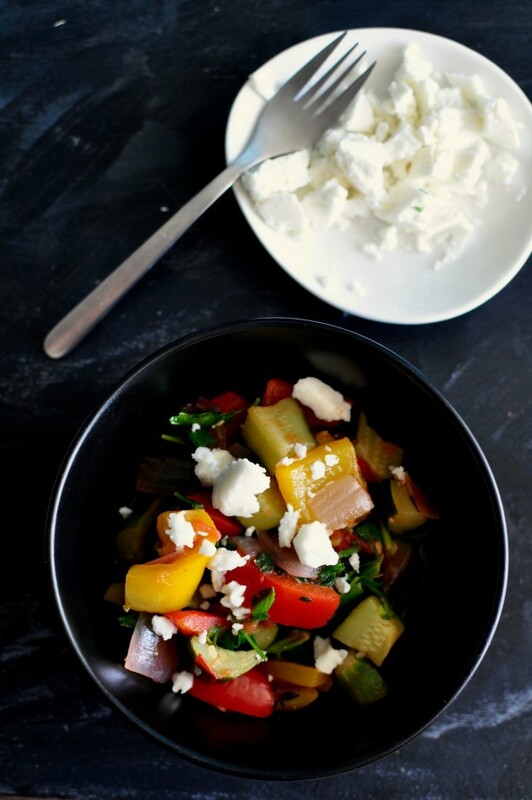 That’s exactly what this spring ratatouille is. This entry was posted in Fast Weeknight Dinner, Lunch for Work, Main, Potluck Dishes, Salad, Side dish, Vegan and tagged Easy, easy ratatouille recipe, easy vegetarian recipe, fast, fast dinner, food, gluten free, Healthy, healthy weeknight dinner, ratatouille, ratatouille recipe, recipe, spring, spring dinner, spring ratatouille, Vegan, vegan dinner, vegetarian, weeknight dinner on June 7, 2016 by mysecondbreakfast.